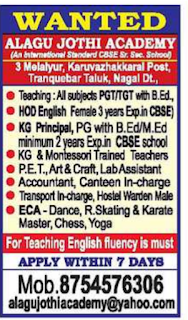 Alagu Jothi Academy,Tranquebar,Nagai has advertised for the recruitment of Teaching Faculty- PGT/TGT,HOD,KG Principal,KG Teachers jobs vacancies. Interested and eligible job aspirants are requested to apply immediately. Check out further more details below. Name of the School: Alagu Jothi Academy, Tranquebar,Nagai. About School:.AlaguJothi Academy CBSE School with an international standard is situated at Melaiyur-Karuvazhakarai, which sprawls with a lush green campus on 20 acres with all latest amenities and stands tall on a 3 floor building with a state of the art architecture. This School is a senior secondary school affiliated to CBSE New-Delhi and was started on June 2nd 2009 from KG to Std VI and has now grown up to Std. XII. Good communication skill is expected. 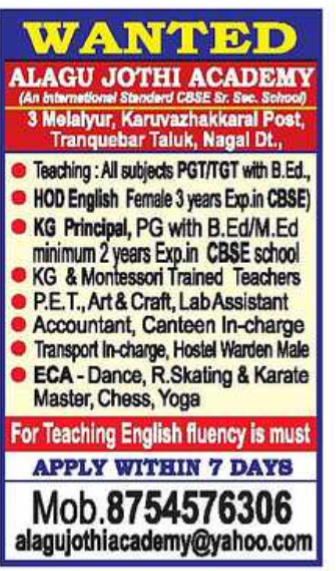 Salary Package: Not Constraint for apt persons with experience and fluency in English. How to Apply: Interested and Eligible candidates are apply with in 7 days by email.